After three years of reading references to “Mary’s Bar” on the Ivicourt.com website, during our 2014 trip to Alonnisos we were inspired to finally visit there and have dinner. My wife’s mother and step-father (Elaine and Peter) came with us that evening, during which we also had the opportunity to listen to three exceptionally talented musicians from Athens. That evening we ordered pasta dishes that were very tasty, and as the photo to the left indicates, the portion size was very generous. 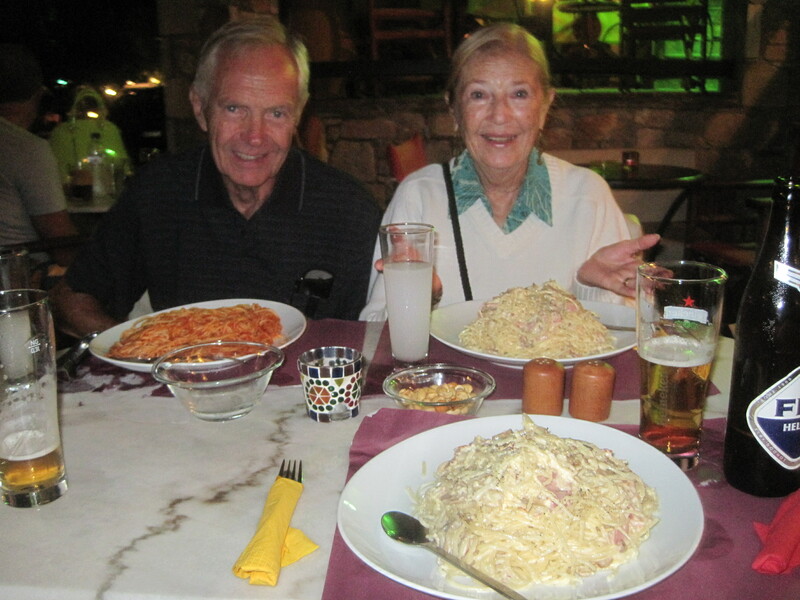 All of us greatly enjoyed our meals and left there feeling completely satisfied with all aspects of the experience. Based on that very positive first visit, Andrea and I returned to Archontostasi several more times during our stay, sampling other items on the menu. These included a delicious chicken with mustard sauce entrée, an excellent soya sauce-based chicken dish, and a wonderful Margherita pizza with great flavor and a very tasty, bakery-like crust. In addition to the excellent food, we found the service to be very good as well. The waiter who took care of us, Jorgos, was very friendly and efficient, and Mary the owner (pictured with me to the right) was very welcoming and kind to us each time we ate there. Archontostasi is actually quite a large place, as there are outdoor terraces both in front of the restaurant and at the rear as well. The view from the front terrace is quite lovely, as it looks out toward the north side of the island. In addition, there is an indoor seating area available just in case it rains or the winds pick up. Please note that Archontostasi also offers free Wi-Fi access for its customers. 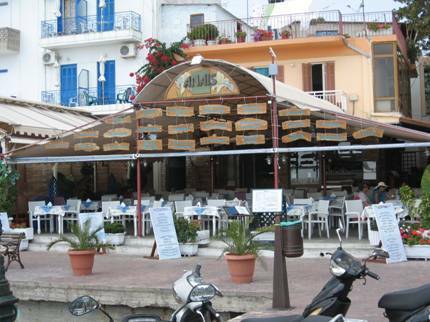 Another good quality restaurant in the Old Village of Alonnisos is the Panselinos Estiatorio & Bar. 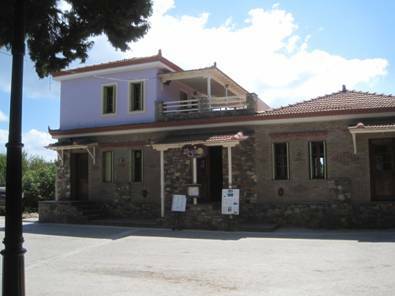 Conveniently located directly across from the place where the city bus lets passengers from Patitiri off, Panselinos is housed in a beautiful, expansive building that offers more seating than any other restaurant in the Old Village. 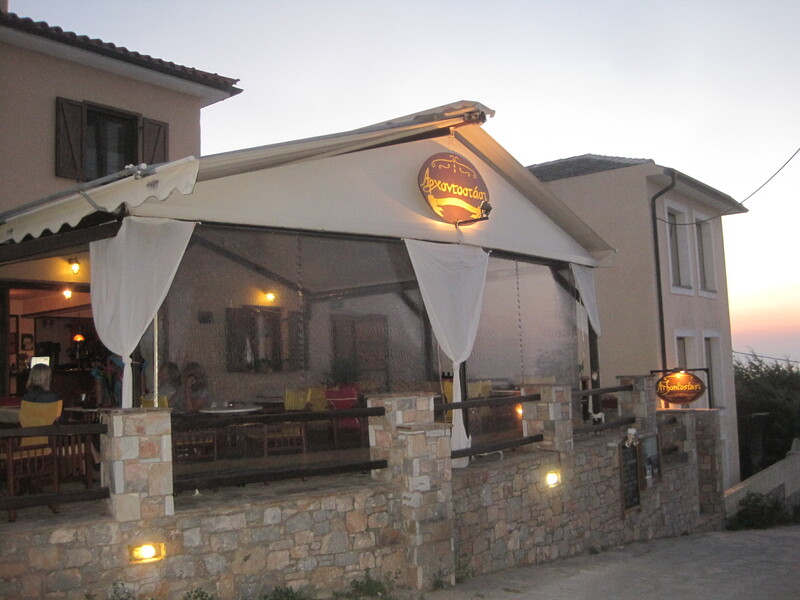 Panselinos has an extensive menu featuring a wide assortment of traditional Greek dishes, and offers a full liquor bar as well as a nice selection of wines. In addition to its indoor seating, Panselinos has an outdoor area (see photo to your left) with a number of tables for folks who prefer to dine al fresco. This restaurant also offers free WI-Fi access, which makes it a very popular place for anyone with a laptop or smart phone that needs to access the Internet. 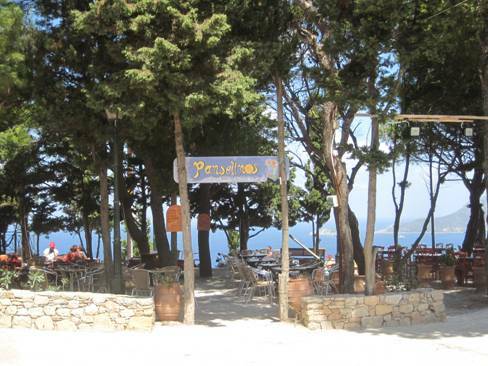 When you visit the Old Village, be sure to stop by Panselinos to sample their cuisine, or to have a cold beverage or a coffee drink while you enjoy the view. To contact me via email with any questions regarding this post click here. 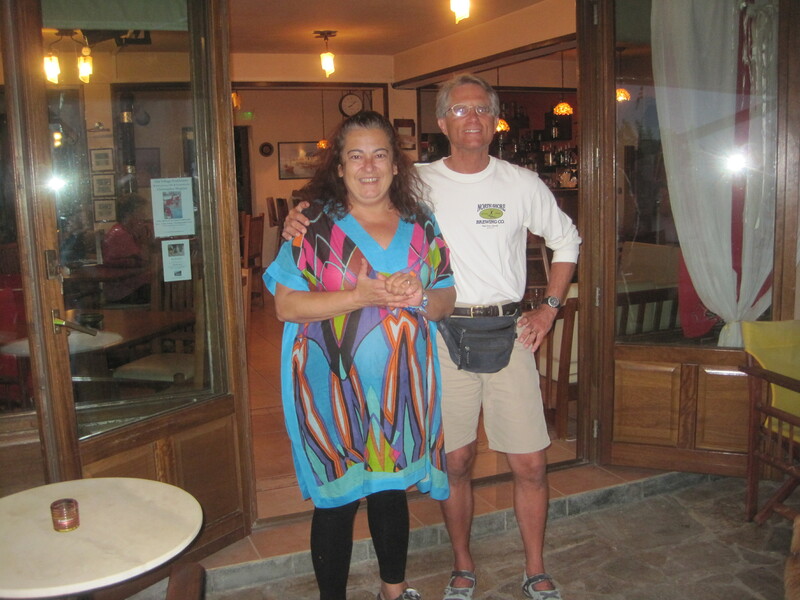 The restaurant we visit most often in Patitiri is called the Ostria Restaurant, and it is operated by Eleni Anagnostou-Cupcea and her husband Victor. Her mother, Maria, also plays a big role in running the business. We originally met Eleni in 2000 when we spent the entire summer in Alonnisos so that I could work on my first book, and over the years she has become a dear friend to us. Ostria Restaurant has an expansive menu, so large in fact that I’m amazed Eleni can make so many different types of food available on a daily basis! Lunch and dinner menus include hot and cold appetizers, numerous salads, and pizzas as well. As for the entrees, it is in this area that Eleni’s fantastic cooking skills are most apparent. Her oven-baked dishes, including some lamb and chicken entrees, are simply wonderful. 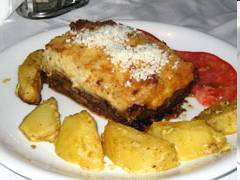 She also prepares traditional Greek dishes such as Moussakas and Pastitio if you have a preference for those. In addition, once dinner is over there are various dessert options, and the Ostria Restaurant also has a wide selection of aperitifs, coffee and tea as well. 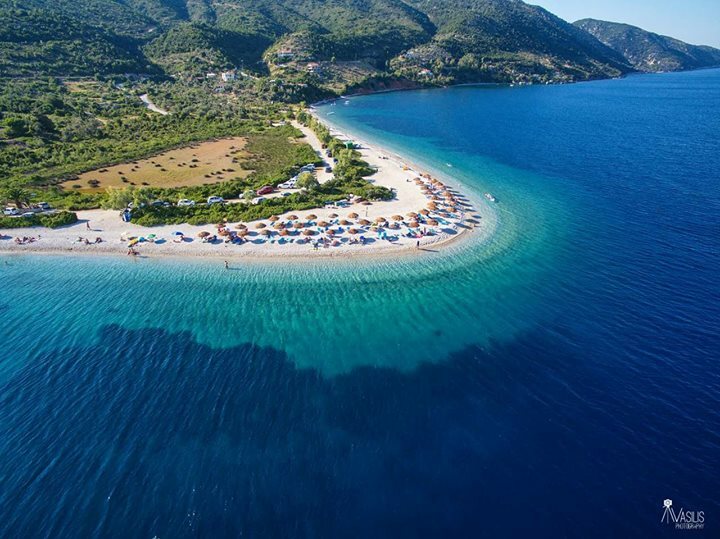 The Ostria Restaurant (pictured to your right) is located right on the waterfront in Patitiri very near to where most of the hydrofoils and day-boats arrive, so it is very centrally located and offers a great view of the harbor. It is also a Wireless Access Point if you are traveling with a laptop and need Internet access. The location also makes this restaurant an excellent place to sit and people watch. At night the opportunities to do just that grow exponentially as numerous tourists typically flood the area looking for a place to eat. Assuming you take our advice and visit this brilliant estiatorio, please let Eleni and Victor know that Jeff & Andrea from Chicago sent you! Whether you do that or not, I’m certain you’ll be glad you stopped to eat there, and I have no doubt you’ll want to return for more of Eleni’s superb cooking and the entire family’s sincere hospitality. 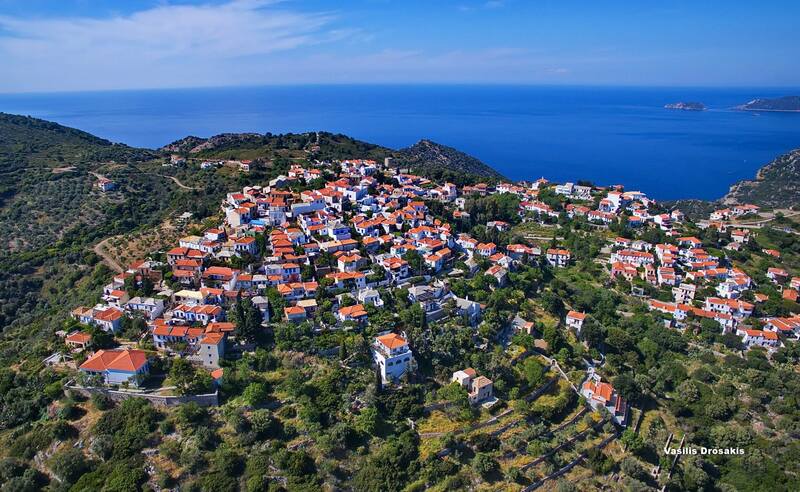 To check your email or surf the Web while on Alonnisos you have multiple options, for as of the summer of 2017 the vast majority of restaurants, cafes, hotels, pensions, and rental homes offer wireless Internet access. The businesses typically make the wireless connection available for free, but in the majority of instances you will need to ask the proprietor for the security code to join the network. 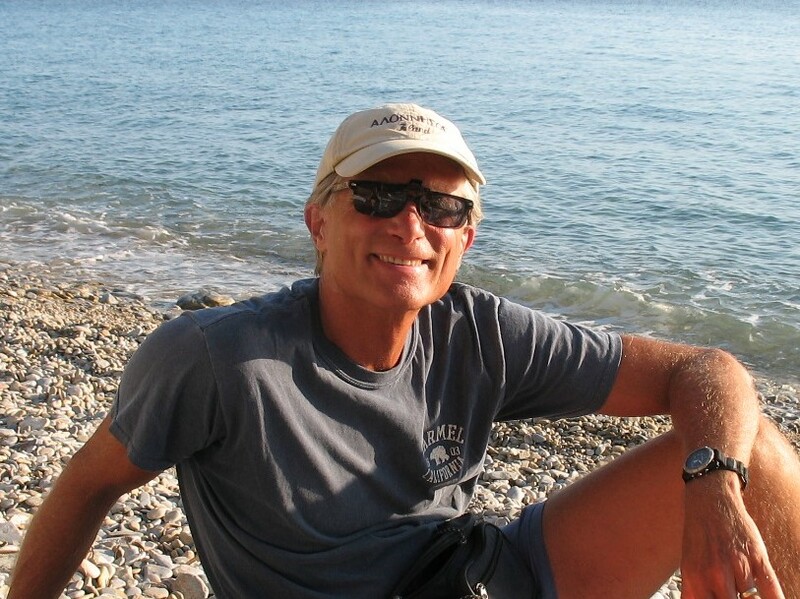 In some cases, hotels and pensions only make the wireless connections available to their paying guests, which is fully understandable. 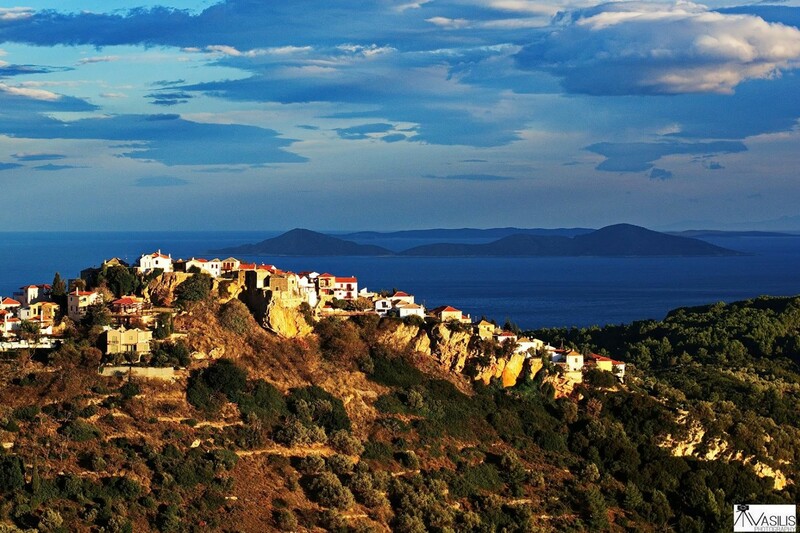 In Patitiri, I know for certain that wireless access is available to customers of the Ostria Restaurant. 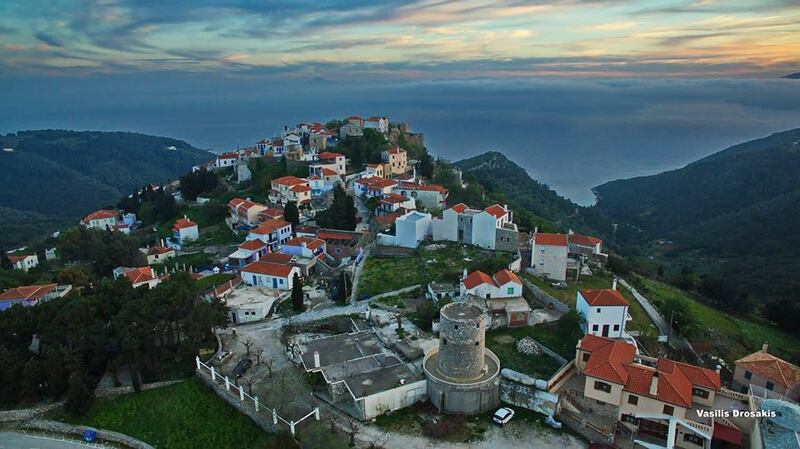 In the Old Village, the Kastro Restaurant offers free wireless access for customers, as does the Panselinos Restaurant and Bar, which is located right where the bus from Patitiri stops, and the Archontostasi Restaurant and Bar (also known as “Mary’s Bar). In addition, there are several other restaurants and hotels/pensions in the Old Village that offer wireless Internet access. 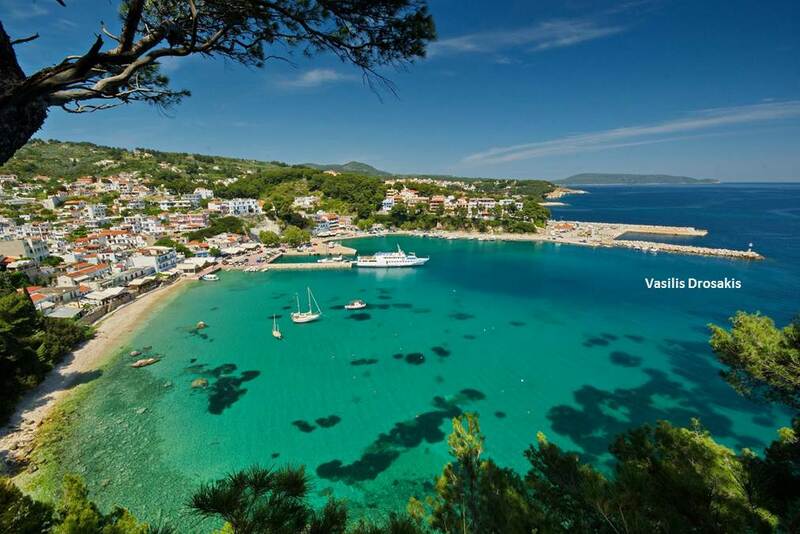 Whether you are in the Old Village, Patitiri, Votsi, Steni Vala, Milia Bay, or any other location in Alonnisos, you’ll need to check with the particular business (i.e., restaurant, hotel, etc.) about wireless access.